Please welcome our newest reviewer, Naomi from Create-Believe-Dream. Having just finished Martel’s somewhat harrowing book Beatrice and Virgil I wasn’t sure what I was getting into when a neighbour loaned me The Life of Pi. One thing I did know for sure is that it would be exceptionally well written; it was, and also, I think, deserving of a place on the 1001 books list. 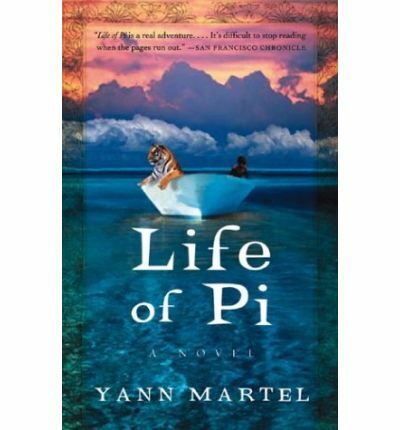 The Life of Pi is the story of an Indian boy named Piscine Molitor Patel (Pi), who has an unusual interest in religion and whose father is a zoo-keeper. Pi enjoys an idyllic childhood in India, living on the grounds of a zoo and exploring Islam, Christianity and the Hindu faith before cultural and political unrest prompt his family to immigrate to Canada, selling all their animals and setting sail as the only passengers in a Japanese freight ship loaded with cargo bound for American zoos. The ship sinks while at sea and Pi finds himself on a lifeboat with no-one but a Bengal tiger as company for 227 days. What follows is an extraordinary tale of survival, made all the more amazing by the prefix from the author that tells the reader the book is based on a true story. The voice of the narrator Pi is beautifully written. His love of animals and God in all his manifest forms weaves in and out of the narrative giving it a fantastical almost mythical element. The relationship between Pi and the tiger is moving and heartfelt, full of pathos, fear, sympathy and humanity. His relationship with the tiger proves to be the saving grace for Pi, giving him the wherewithal, the motivation and the strength to deal with the despair of his situation. Despite the bulk of the book being set on the lifeboat with not a lot of plot to move it forward, I was totally engrossed and finished the book in two days (admittedly I am a fast reader). The character of Pi is a times wise and innocent, brave and foolish, and almost accidentally resourceful. But always enchanting, imaginative and believable. In the prefix a character tells the author that this story “will make you believe in God” and ultimately Pi’s unwavering faith in the face of his hopelessness and despair is what the book most palpably left me with. Martel has written a story in the best tradition, juxtaposing the everyday with the divine, the magical with the horrifying and joy with tragedy. I would unreservedly recommend this book to any reader. It was an entertaining, illuminating and inspiring read. I love a beautifully written book and the way you talk about the narrator makes me want to read it for sure now. I also love a little magic in my books (magical realism is one of my favorite genres, swoon). Everything points to yes, read this, stop procrastinating. YAY! Excellent Cassie! I’m glad you’re convinced.